Year of the Rooster is Davidoff’s fifth annual international release celebrating Chinese New Year with its sign of the zodiac. Like the earlier releases, it is a limited edition with special aged tobaccos and a high price tag. The cigar itself is a 6.75-inch diadema with a ring gauge of 50. 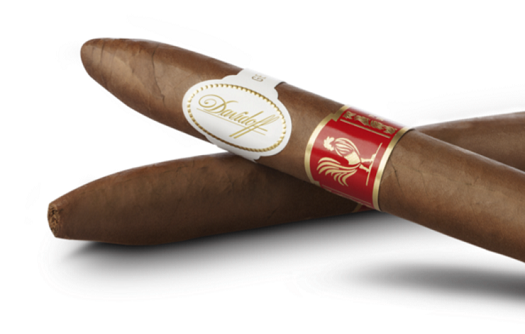 The white Davidoff band is offset with a secondary red and gold one highlighting the cigar’s name and a drawing of a rooster. Eight thousand of the striking 10-count red lacquered boxes were produced, with the per-stick price set at $40. The wrapper is an Ecuadorian Habano-seed leaf, with a Dominican San Vicente binder and Dominican filler, which Davidoff identifies as Piloto Seco, San Vicente Visus, Piloto Visus, and Criollo Seco. I smoked two for this review and was impressed. Admitting up front that I’m no expert on Cuban cigars, I found the Rooster to be reminiscent of some of the best Cubans I’ve smoked. It started a little peppery with medium strength and shifted after about an inch to a nutty flavor with some fruit-like notes. About halfway through, I began to pick up some vanilla and cedar added to the mix as the strength increased. The last half or so was also marked by a rich tobacco sweetness. Like so many Davidoff cigars, the Rooster is incredibly smooth, balanced, and easy to smoke. The draw and burn were near perfect throughout. Of course, the price tag puts this cigar out of reach for many smokers, except possibly as a celebration candidate. Is it worth $40? Is a lousy cigar worth $3? Is a mediocre cigar worth $8? Those are questions that cigar smokers have to decide for themselves. But, if you’re a Davidoff fan or like to sample small production cigars, I think you’ll want to try one. I found it exemplary and rate it four and a half stogies out of five.